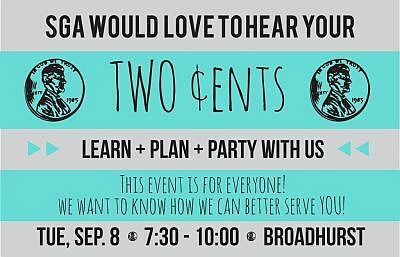 Tuesday, September 8th, from 7:30 p.m. to 10 p.m., the SNU Student Government Association (SGA) will be hosting an event in Broadhurst Gymnasium where you can give them your 2 cents. The annual event is your chance to be heard by having a say in what activities SGA will be hosting throughout the year and helping mold those activities they are already planning. 2 cents is a chance for the entire student body to get together and speak to their SGA representatives in a relaxed and fun environment. While speaking to the council as a whole, the event will also allow for a more intimate environment in which students will be able to meet with specific officers in small groups. In the past, ideas from this event have had an impact on campus events such as Kingdom Come and where the winter spiritual retreat was held. The feedback SGA receives allows them to cater to what students are seeking in the sponsored events. SGA feels that the more people that they can draw to an event, the closer the SNU community will become. At this event in the past, SGA has seen an underrepresentation of sophomores, juniors and seniors. Timothy Riggs, Athletic Relations Executive stated, “There has been confusion in the past that this is only an event for freshman, and that’s not true. So, a lot of times you only see freshman or just a handful of sophomores.” Riggs stresses everyone is welcome regardless of class or interests. In addition to being able to talk to your SGA Representatives, food and games will be offered. Nine square, four square and board games are just a few of the entertainment options that will be available. To round out the night pie and desserts will also be made available. Matthew Lawrence, Vice President of Campus Ministries, would like students to know that “The events that SGA come up with are for the student body. They are not for SGA, the faculty or staff. They are for you guys (students), and the only way that we can make it fun for you is if you let us know what you would like to see.” Students are encouraged to show up at the start time of 7:30 p.m. so that they can fully take advantage of all of the activities that will be offered.